Unken is a village in the Pinzgau area of Salzburg. Unken has a total population of 2,000 and is situated in the Saalachtal valley - just north of Lofer and south of the border to Germany. The village is connected with its neighbour Lofer through the Kniepass, a mountain pass. Unken is considered to be a great place for hiking: It is well-accessible from Salzburg and the airport via Germany and surrounded by very scenic mountain ranges of the Northern Calciferous Alps. At the base of the Saalachtal, you will find the river Saalach with pretty swamps and woods surrounding it. The most important mountain ranges that you can see and access from Unken are the Reiter Steinberge (sometimes called Reiteralpe) with the 1864 metre high "Drei Brüder" as the highest summit; and the Chiemgauer Alpen with the 1961 metre high Sonntagshorn as their prime summit. 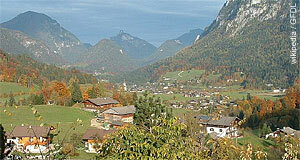 Unken is very popular for hiking holidays, but not a purely touristy village - the vicinity to Saalfelden means that several people commute to this city. One thing that Unken does not offer - on contrast to many other places in the Pinzgau area - are skiing opportunities. There are a few ski lifts in the Heutal area (drag lifts) that take you to altitudes of up to 1776 metres (Dürrnbachhorn). However, this skiing area is of local significance only. That being said, if you have your own mean of transport, you might want to explore opportunities to drive to skiing areas such as Saalbach-Hinterglemm, Leogang, Zell am See or Kaprun.